Comments Off on Productive Meetings: Possibility or Pipe Dream? 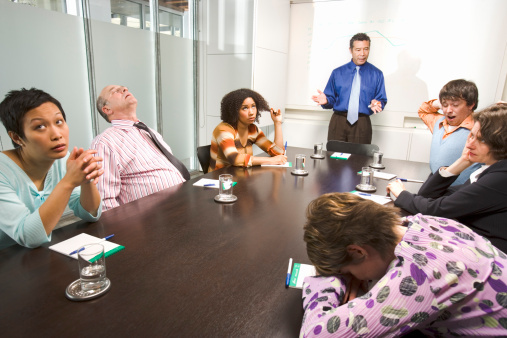 If you often lament about how much time you’ve wasted in useless meetings, you’re not alone. As an employee, you sit there thinking about all the things you could be accomplishing as precious minutes, and possibly hours, tick away. As the employer, you need to think about the same thing, but just on a larger scale: If you have eight people sitting in an unproductive meeting for just one hour, you’ve basically lost eight hours of work. That’s nearly the equivalent of a full day. But productive meetings are possible. You just need to plan them very wisely. What outcome would make you feel your meeting was a success? Perhaps you need to walk away with a final decision on the name of a new product. Or maybe you want to develop a new incentive plan. Even if it is simply a brainstorming session, you should still have a goal – perhaps to walk away with four new ideas that meeting participants will pursue. This is the purpose of the meeting. If the purpose isn’t clearly established, it’s a waste of time. In order to fulfill the meeting’s purpose, what has to happen? What topics will be on the table – and what topics will be off limits? If you can anticipate where the meeting might go off track, let people know ahead of time that those issues will be addressed at a later date and should not be brought up in this meeting. What will each attendee be expected to contribute and how does it relate to the meeting’s purpose? For how long will each participant have the floor? This is the agenda. Everyone should have this information far enough in advance to prepare well for their part. Don’t forget to make room arrangements. This includes everything from selecting and scheduling the location to having all required equipment in place to providing refreshments if necessary. Have you based the invitees on the agenda? Be sure that the people you’ve invited are all able to contribute in some way to the success of the meeting. If not, they shouldn’t be there. Keeping the number of attendees as small as possible usually makes for a much more productive meeting. You might also want ask yourself just how necessary an actual “meeting” of all of these people is. If you are just dispersing information but don’t require direct input from everyone, perhaps an email or a newsletter would be a more efficient course of action. Be sure everyone is clear about who is leading the meeting. As the leader, it is up to you to start and end the meeting on time. You also need to ensure that everyone gets their chance to participate. Don’t let any one person dominate the discussion, and pay close attention to the time and your agenda to be sure you stay on track. Always keep your purpose in mind and tactfully redirect any discussion that strays from your goal. As each agenda item is addressed, summarize what was agreed upon, making clear what action item will come from it and who is responsible for it. Provide minutes within one business day. The minutes serve several purposes. They document exactly what was covered and agreed upon so there is no confusion. They remind people of the next steps and pinpoint who is responsible for which follow-up activities. And the minutes provide a review document that can be used to measure progress. This can be especially helpful in preparing for a follow-up meeting if one is necessary. Remember, don’t cram too much into one meeting or you’ll be setting yourself up for failure. Be realistic about your purpose and what can be accomplished in one meeting. And try to avoid scheduling meetings that are so long, that participants glaze over and can no longer be productive. Depending on the scope of the issues at hand, you may need several meetings to follow up. In the long run, you’ll save time and get much better results when you think things through in advance, invite only the people who are absolutely necessary and have a clear goal that all participants are prepared to help achieve.